It seems like only yesterday that you either hatched your chicks or they arrived from the feed store or in a box through the mail. But it's been almost 4 months and they are getting bigger. You start to wonder when you can expect some eggs. You might wonder what you need to do to prepare for the big day - when you peek into your nesting box and see that first egg from your backyard chickens! 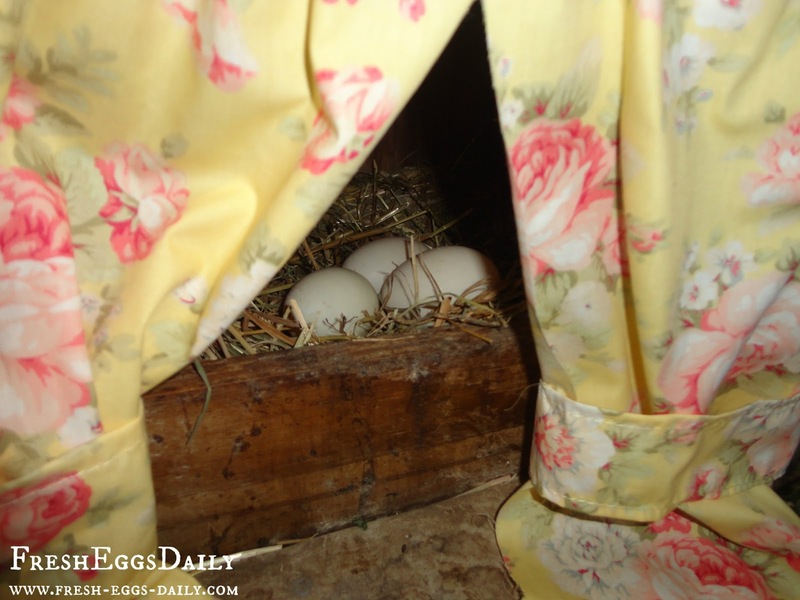 I've been collecting eggs from our backyard chickens for nearly five years and did it as a kid for years as well, and I can tell you that the magic never wears off! Every day is like Easter, especially if you have breeds that lay colored eggs. But every egg is a miracle regardless of color. Chicks, referred to as 'pullets' until they are a year old, will generally begin laying anywhere after week 18 - and usually by week 26 or so. Some may start as early as week 16, but it's rare. 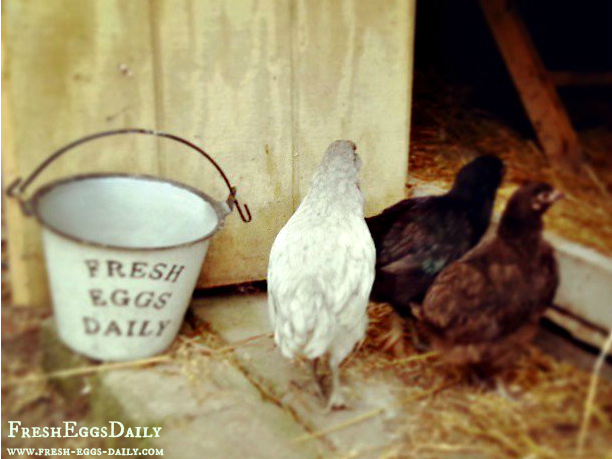 Just before they start laying, they will start squatting when you approach them. This is a submissive posture they take, usually for a rooster or dominant hen, or you as the alpha hen. You can expect eggs very soon after they start squatting. You also may notice your soon-to-be-layers checking out the nesting boxes. They might even hop in and get comfortable, trying them on for size, so to speak. Put some fake eggs in the boxes to show them where they should lay their eggs. Wooden or ceramic eggs, golf balls, plastic Easter eggs or even stones will help entice them to use the boxes. Be sure your boxes stay full of soft nesting material. Straw, pine shavings, shredded paper or even cloth or old towels are all good choices. 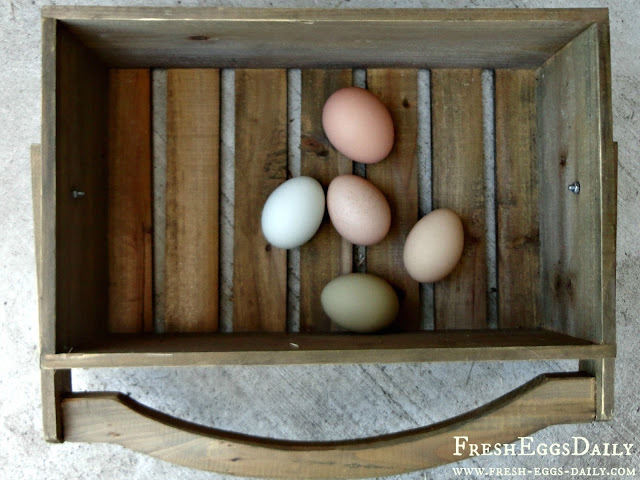 A piece of rubber shelf liner cut to size in the bottom of the box can help prevent broken eggs in case the nesting material is pushed aside. Keeping the nesting material fresh and clean helps keep the eggs clean. Eggs don't need to be washed after collecting them and will last for at least two weeks on the counter unwashed and un-refrigerated. For more on proper handling of eggs, read HERE. 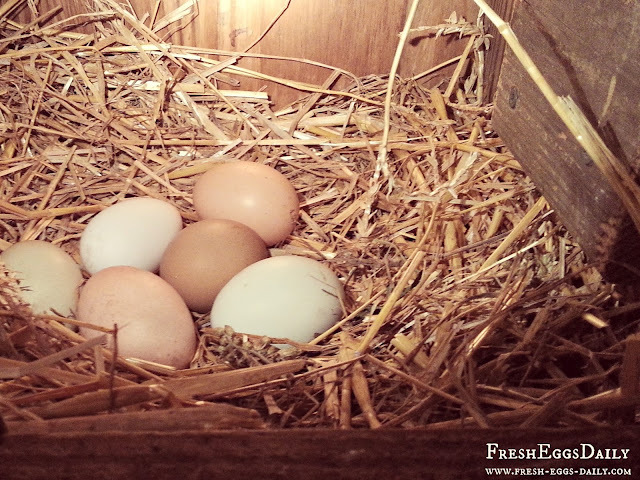 Rule of thumb dictates one box for every 4-5 hens but realistically they will all want to lay their eggs in the same box. There's a school of thought that believes that seeing another egg in the box leads a hen to believe it's a safe place for her egg. Another school of thought says the hens are all contributing to a mutual 'clutch' of eggs that one will then sit on to hatch the eggs. 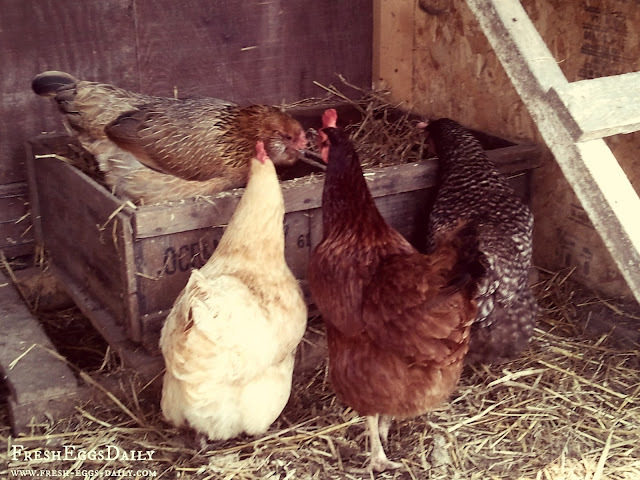 So be prepared for nesting box 'wars' which can get very noisy and animated and often lead to two or even three hens crammed into the same box at the same time! Keep your pullets on the starter/grower feed until around week 16 or thereabouts. I try to time it so that I use up my last bag of starter feed somewhere around that time frame, then I switch to the layer feed at that point. Layer feed has the additional calcium that the hens need to form hard shells on their eggs. While layer feed won't 'make' them lay, it does provide them all the nutrients they need to lay healthy eggs with strong shells. I mix in some supplements to my Breakfast of Champion Layers for increased egg production and flock health. 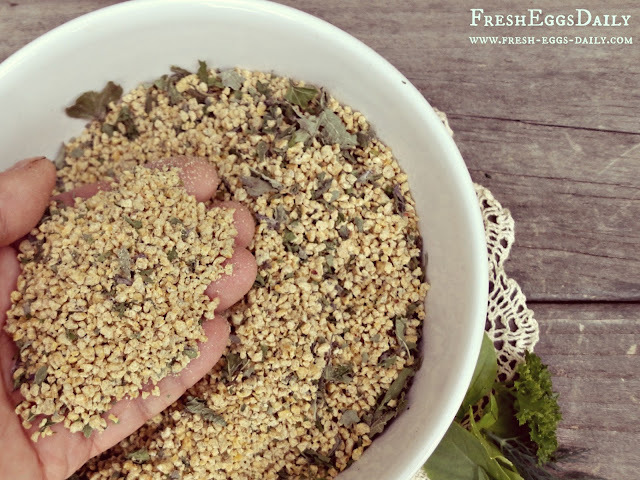 It has oats, flax seed, probiotics, brewers yeast and dried, crushed herbs for optimal health. This source of additional calcium should always be fed free-choice so hens can eat as much or as little as they need. A chicken lays an egg approximately once every 26 hours. Sometimes if two yolks are released into the oviduct too close together, you might get a double-yolked egg. They are more common in younger layers. Sometimes you might see a tiny egg, about the size of a marble, commonly called a 'fairy egg' or a 'wind egg'. It's just a glitch in production and also common in new layers. No chicken lays an egg every day, although a world record-laying hen, an Australorp, did lay 364 eggs in 365 days, but the norm for most breeds is somewhere in the 200-300 eggs/year range so there is no need to worry if your hens skip a day or two here or there. 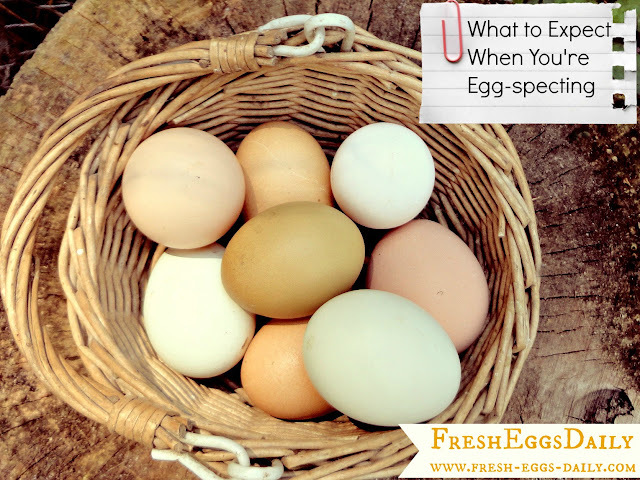 Normally you should expect 4-6 eggs per hen per week, depending on the breed and time of year. Many factors can affect egg production, so you want to provide your hens good-quality layer feed, a calcium supplement, fresh water and a clean, safe place to spend their days and nights for maximum production. After she lays her egg, the hen will sing her 'egg song'. She seems to either be letting everyone know of her accomplishment or (which I believe) she is making a commotion to lure any potential predators away from the nest. Either way, be prepared for lots of celebratory cackling soon from the coop! With just a few simple preparations, you should be enjoying fresh backyard eggs any day now. And trust me, the magical feeling never goes away. Six months old now but only 11 hours of daylight. Will they molt with winter coming on? I have 16 pullets that are all about 16 - 18 weeks old now. One of them started laying about 10 days ago, and has laid a tiny egg every day since. I think she is laying early, and she is still fairly young, so I am hoping her eggs get a little larger! She is a Rhode Island Red, and they are known for being really good layers.